Thousands of angry Bolivians took to the streets Thursday to protest a decision by the country’s Supreme Electoral Court allowing long-serving President Evo Morales to stand for a fourth term in office. Although Bolivia’s constitution bars him from running in next October’s election and a 2016 national referendum determined he should not be allowed to change the constitution to do so, the court, nevertheless, ruled in his favor on Tuesday. 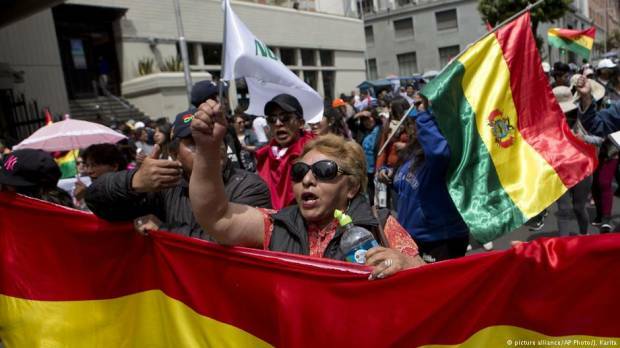 In the capital, La Paz, as well as major cities, including Santa Cruz and Cochabamba, angry protesters blocked streets and disrupted public transportation, chanting and waving banners emblazoned with the words “Bolivia said NO,” in reference to the 2016 referendum. La Paz Mayor Luis Revilla, who opposes Morales, said, “What remains now is to resist this decision, to turn to the streets in protest, to prevent this decision from being realized.” Former President Carlos Mesa, Morales’ main opponent in next year’s election, called for the opposition to wage “a democratic battle” against the court’s ruling.